It was Owain Glyn Dŵr’s day on 16 September, an unofficial holiday which is celebrated annually in Wales. His flag was flown outside the Senedd in Cardiff for the first time last year, a symbol of a self-governing Wales. This was the first time in 600 years that the flag was flown outside a Welsh parliament. But who was Owain Glyn Dŵr, the man who placed second on the 100 great Welshmen list? 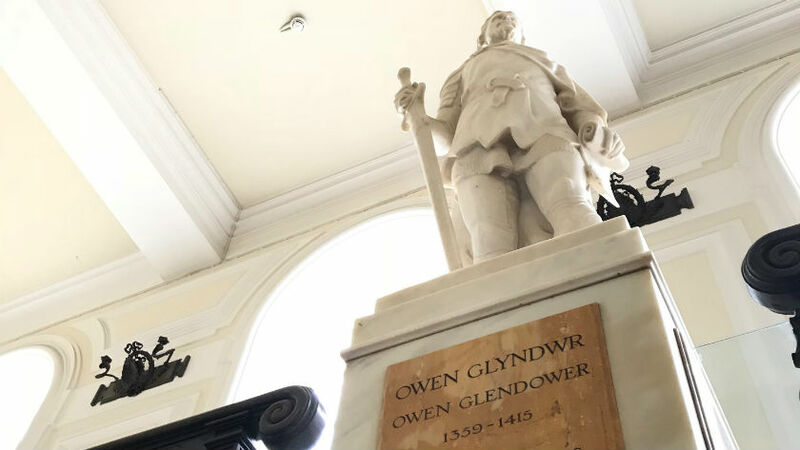 A descendant of the princes of Powys and immensely proud of his Welsh roots, the date of Owain Glyn Dŵr’s birth is uncertain. One manuscript states that he was born in 1359. On another, there is a specific date – the 28 May 1354. Some say that he was born in 1349, the year of the Black Plague. Little is known about his early life, but he spent some time studying at the Inns of Courts in London and could speak four languages. He envisioned a national parliament, an independent Welsh Church and a University for Wales – a vision that some would say was ahead of his time. Owain Glyn Dŵr summoned a parliament in Machynlleth in 1404. There he declared his vision for Wales as an independent state with two universities, one in the south and one in the north. He reconstructed the legal system in Wales with the intention of bringing back the laws of Hywel Dda.